Readers of my blog will note that I write and post letters to my relatives who have left this realm for another. These letters are the means I have chosen to document their lives and to secure them in my memory and the memories of our children, our grandchildren, our relatives and our friends. The following obituary appeared in San Antonio’s Express-News on November 22, 2010. My wife and I met in August of 1952 and married just four months later on a Saturday afternoon on the thirteenth day of December that same year. We were together for the next 58 years except for the twelve days remaining in November and the first thirteen days in December. We are still together and we will remain together throughout eternity, both in this realm and the next. Janie Alta Dyer, age 78, an eleven-year survivor of ovarian cancer, died at her home in San Antonio, Texas on Thursday, November 18, 2010 from complications of that disease and kidney failure. Janie was born on December 26, 1931 in Broxton GA, one of six children born to John James McLean and Wootie Pridgen of Pridgen GA. She met and married Hershel Mike Dyer of Columbus MS in 1952 in Douglas GA and is survived by him, her three daughters, their husbands and her grandchildren: Debra Janet Dyer and William Talbert of San Antonio TX and their daughter and son, Lauren Ashley Talbert and Landen Dyer Talbert, Cindy Dyer and Michael Schwehr of Alexandria VA, and by Kelley Dyer and James Brantley Saunders of Wylie TX and their son and daughter, James Brennan Saunders and Macie McLean Saunders. Janie is survived by three sisters and one brother: Winnie Sapp of Hamlet NC, Evelyn Pridgen of Brunswick Ga, Christine Young of Fitzgerald GA and Charles McLean of Pridgen, GA. She was preceded in death by her father in 1954, her mother in 1985 and her brother John Herbert McLean in 1997. Over the years Janie has expressed admiration and love for those involved in her health care, including the staff at Brooke Army Medical Center (BAMC) and Wilford Hall Medical Center (WHMC), with particular affection for those involved in the chemotherapy clinic at WHMC and those in Oncology, Nephrology, Vascular Surgery, Interventional Radiology and Dialysis clinics at BAMC. She viewed them as angels placed on earth to guide her through perilous times. Her family echoes her sentiments, and they also thank the staff of Odyssey hospice for their loving care and professionalism. Janie’s highest praise for others was that they were good persons, and her life echoes and exemplifies that expression. She was a good person throughout her life. She will be missed in this realm, and will be welcomed in another. Memorial services will be at 11:30 AM on Monday, November 29 at Porter-Loring Mortuary North, 2102 North Loop 1604 East. Interment will be in Fort Sam Houston’s National Cemetery at 1:00 PM. I intend to post letters to my wife in the future in order to keep her up to date on family feats and foibles. I know that she will be watching anyway, but I might be able to provide some minor details that she may have overlooked. If they don’t have computers there now, they will have when Bill Gates and/or Steve Jobs relocate from here to there. Listen up, Utah—Tee is for Trooper . . .
You should stop quibbling with the courts and do the right thing—take Jesus and religion out of the equation in your quest to identify and honor those troopers that have died while protecting the citizens of your state. Do away with the cross, at least with the top part of it. Everybody will remember that it was a cross and in their memory it will still be a cross. And trust me, the courts will not order the modified structure demolished. The conversion can be done cheaply and quickly and there is nothing the courts can do to stop it or reverse it or change the modification. It’s so simple it’s a wonder no one has thought of it before now. Leave it to me, your humble writer, to come up with a suggestion that will settle the problems once and for all, and will offend no one, not even Christians. Leave the monuments exactly where they are—remove that part of each monument that stands above the crossbar, and the result is what you see in the image on the right. Just change each cross to a capital Tee, with the understanding that the capital Tee stands for Trooper, the noble profession of the officers that are being honored and memorialized by the monuments. The crossbar of the Tee will still provide space for the personal information on each trooper. It’s only fair—what is the religious makeup of Utah’s state troopers? 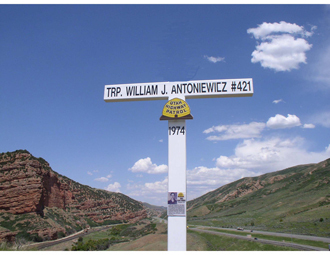 Are there any Jews, Agnostics, Muslims, Hindus, Athiests, Buddists, Taiosts, Wiccans, Pagans, Druids or Scientologists listed on the rolls of Utah’s troopers? There are legions more of those that profess to embrace religions other than Christianity, and you can be assured that none would want the cross to be used as their memorial. If your rolls include such persons, how will they be honored if they die in service to the state? Certainly not with the Christian cross—none of those troopers are Christians, and neither they nor their loved ones would agree for a cross to be erected in their memory. They would, however, agree to the use of a capital Tee in recognition of their contributions to society and to honor their memory. And if there are none presently on the force, would you deny employment as a trooper based on an applicant’s religion being other than Christian? Of course not—talk about a case that would lose in court—it would never get out of your local courts. So let’s do it, Utah—let’s do it now before destroying all the crosses. Simply modify them as suggested and make the courts and the atheists and all the rest of the nit pickers happy—they may change their stance and decide that the Tees are an eyesore and are obstructing Utah’s magnificent views, but that one will sail through the courts on your side! That’s my suggestion and I’m sticking to it! PeeEss: I offer this suggestion without any anticipation of remuneration, but I would appreciate a word of thanks!